The Ragnarokker is a boss monster. The Ragnarokker is an artistic soul — one who will aggressively vibrate the skin off a hero's bones with his mighty riffs. 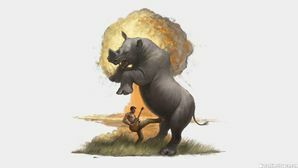 Above he can be seen kicking a massive beast in the nethers, his life is not a concern to him as guitar shredding is all that matters. Occasionally, a nuclear explosion may occur due to the immensity of his musical savagery, hence the name.